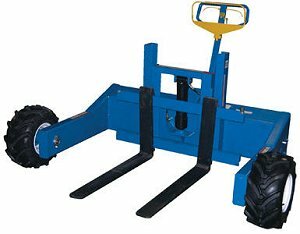 All-terrain pallet truck with gas-powered traction drive system, great for moving heavy loads over rough terrain, features 2000 lbs. or 4000 lbs. 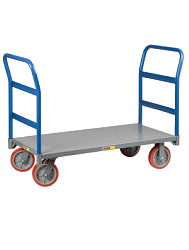 capacity @ 18" load center, unit also includes powered fork lift and lower, steel construction for years of dependable use with blue painted finish. Usable width between outriggers is 50"